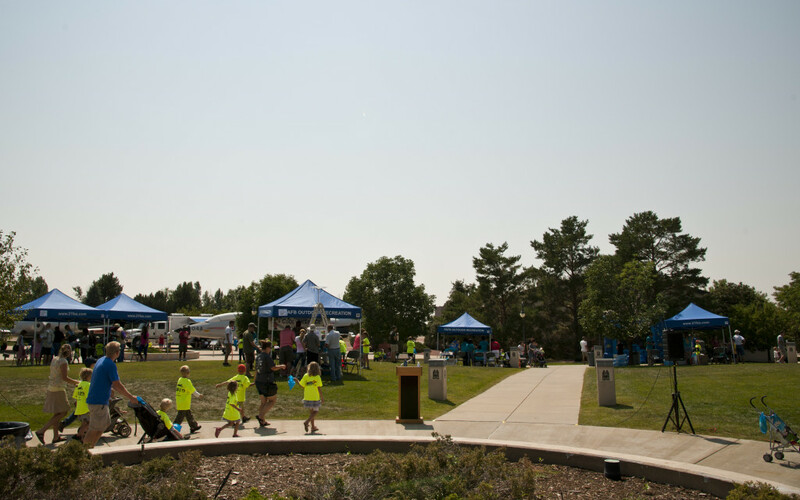 September 1, 2015 – Military families from all over Colorado made their way to the STEM Rocks! Fair at the Peterson Air and Space Museum on August 29. Approximately 2500 people came out to the fourth annual Science, Technology, Engineering and Math event on Peterson AFB. This was the third time the Peterson Air and Space Museum hosted the event. There were 25 booths, including organizations like the U.S. Air Force Academy STEM Club, National Park Service, Society of Women Engineers and more. The attendees created and launched rockets, mined for minerals, watched a chemistry magic show, saw electricity demonstrations, ate free food, and collected swag. During the chemistry magic show, children shot out of their seats to be picked for a demonstration led by Ronald Furstenau, wearing his lab coat with a collection of pins and of course his safety glasses. Parents would also become assistants in his experiments. The families even experienced demonstrations from Peterson’s Military Working Dogs. The crowd laughed and cheered while the K-9 handler praised his K-9 partner for attacking the trained assistant. “The event brings various organizations together in one location with the ultimate goal of emphasizing the importance of STEM education to the younger generations,” said Capt. Leilani Distaso, National Security Space Institute assistant course director space 200 and STEM Rocks! Fair action officer. “This is the pinnacle point in any child’s education where we are able to inspire them to pursue a STEM related education. “We (society) hold a lot of value in STEM education, not only because it develops our generations to think critically for themselves but for our nation,” said Distaso. In order to make this event so successful the volunteers had to put in a lot of long hours and hard work months before the event, said Whalen. Many of the volunteers are young officers and enlisted Airman experiencing STEM Rocks! for the first time. Additional partners to the STEM Rocks! Fair were the Peterson Air and Space Museum, the Challenger Learning Center and Lockheed-Martin. The fair not only promotes STEM to the younger generations but also highlights Peterson’s STARBASE program. The program is the only STARBASE in Colorado and one of 58 in 31 states including Puerto Rico, according to the Department of Defense STARBASE website. For more information on how to can get involved with STARBASE and STEM events visit the STARBASE website at http://dodstarbase.org/.